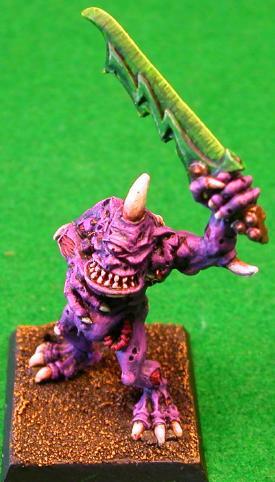 Plaguebearers are Nurgle's assault troops. In 2nd Edition they were better then a Genestealer, I even proved it mathematically. These are perhaps the most fun Nurgle models to paint as there are a pile of different poses available. I also paint them multiple colors which helps tie my army together some and adds variety. I generally field one or two squads of seven, the second squad being called "The Statisticians from Beyond". The one with the gong was converted so I could use my vast Nurgle demon collection as a valid Fantasy army a few editions of the Warhammer rules ago. 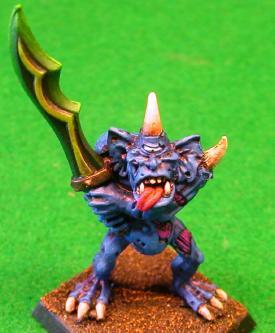 I play Warhammer Fantasy even less then I play 40K. The purple one was an attempt to get a paler purple. I mixed in some Space Wolf grey with the worm purple. I need to work on this some more. I now have seven blue Plaguebearers. These may see use in my third Grand Tournament army. They are all slightly different shades of blue too. I based them all Enchanted blue, then blue wash, another coat of Enchanted blue. I then highlighted each model individually mixing in some Space Wolf grey with the blue. Almost all of my paints are long out of print if you're trying to match my colors. My last ten Plaguebearers all have green swords. Each sword should be a bit different. I had a limited number of paints but I tried lots of styles and techniques mixing up some unique shades. Some of the swords have a god awful number of coats of paint. I used white in the bones on my most recently painted models to contrast the darker skin tones. Until there are rules for Plaguebearers again I probably won't field any of these models as Lesser Deamons. I just think to win games of 40K you need more guns capeable of shooting over 24 inches and hurting AV 13 and 14. Any future army lists I make will reflect that whether they are pure Nurgle armies or a mish-mash of different squads and Chaos powers. I'm going to try harder to win in the future and these models will wait in a box until their are more compelling rules I guess as most every idea I get in the new Chaos codex doesn't involve summoned deamons. I still have a few unpainted ones, I never seem to sell or trade anything away so I may paint them some day. They are fun models to paint.